Secure your tablet in style with the armourdog® LocPad Anti-theft enclosure for the Apple iPad Mini 4. This secure kiosk protects your iPad from theft and damage when it's on display in a retail store, corporate office, school lab, healthcare environment, restaurant or any open access area. The innovative, solid design looks modern and ergonomic while conveying a clear message to would-be thieves. The radio-transparent polycarbonate chassis allows Wi-Fi, Bluetooth and 3/4G to remain fully functional, while the strong metal fascia deters tampering. A concealed charge cable is routed through the aluminium-alloy mounting pole. Choose from five mounting options from floor standing to wall mount. The solid 30° and 45° mounts can be desk or wall mounted to obtain your desired display angle. The goose neck mount is for desk mounting only. The integrated faceplate can be ordered with open or closed camera and home buttons depending on your security requirements. The screw mount base allows installation to a wall or desk without having to drill all the way through to the other side. If you need your tablet to be rotated to landscape or portrait orientation once installed, order the landscape / portrait mount. 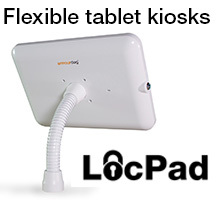 To rotate your LocPad kiosk 270 degrees around its axis, choose the optional rotating desk base mount. Please note. Once installed into a LocPad, you have to unlock the enclosure to gain access to the tablets power button. Please make sure you have thought about the correct software for device and power management of the Kiosk. Keep your devices safe with this 1.5m, tempered steel security cable and lock system. Charge your LocPad from a distance with this certified 3m long power cable. This optional enclosure mount enables your LocPad to be rotated to either Landscape or portrait orientation. Rotate your LocPad kiosk around it's axis with this optional base mount. 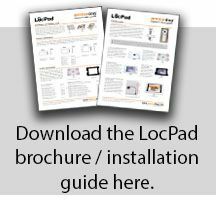 Secure your LocPad to a wall or desk without having to drill all the way through to the other side. © Copyright Lente Designs Ltd 2014. iPad is a trademark of Apple Inc., registered in the U.S. and other countries. All other trademarks are acknowledged.